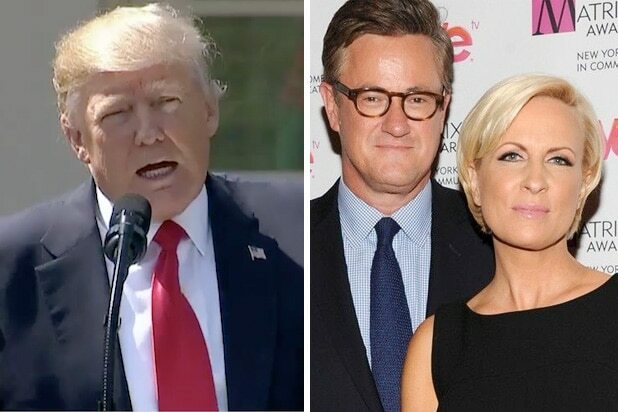 The “Morning Joe” panel was not impressed with Donald Trump’s audacious gambit to meet with North Korean dictator Kim Jong Un later this year. On Friday, co-host Joe Scarborough said the whole thing was motivated by Trump’s desire to knock Stormy Daniels off the front page of the Washington Post. “He did not want the Washington Post to have the word ‘Stormy Daniels’ on the front page today. Guess what. He succeeded,” he added. On Thursday evening, President Trump stunned the world, with the White House announcing that he will sit down with Kim Jong Un in a matter of months. The news definitely did shift attention — for now — from a growing scandal surrounding Trump and a reported affair with adult film actress Stormy Daniels. Trump attorney Michael Cohen paid Daniels $130,000 for reasons that still remain unclear, but has been widely reported as hush money. A new lawsuit by Daniels now asserts that a non-disclosure agreement she signed is null and void because it does not bear Trump’s signature. The suit also intriguingly speaks of “certain still images and/or text messages which were authored by or related to” Trump, referred to in the suit as DD.